We're getting in to the thick of the holiday season now. The shopping, the traveling, its all only going to get more hectic. Every holiday season thousands of people fly in the NYC to experience New York during the most magical time of the year. We're going to provide you with a list of what to do, what not to do, and what to look out for this holiday season so you don't end up letting pain ruin the most wonderful time of the year for you. All the running around, and shopping, checking out the night life in SOHO or the Meatpacking district, taking in the sights in mid town, and checking out the tree at Rockefeller Center, can lead to a lot of walking around and time spent cramped up on the subway. We see a lot of patients from out of town and overseas and often come on on weekend to help them feel better and get out of pain. Always make sure that you are getting plenty of sleep and if you do experience pain see a doctor sooner rather than later. Many of us will be doing some traveling for the holidays, weather its over Thanksgiving or Christmas people want to be with their families and spend time sitting around doing nothing. Seeing loved ones often involves being getting on a plane and spending some time being absolutely miserable, especially during the travel season. Airplane seats are designed to be soft and mushy and have those adjustable head rests that fold in from either side. Unfortunately they do not have a lumbar support curve and the head rests stick out so far it makes the seat concave and forces you to round your back. So make it a point to try and recline the seat as often as possible, and when you get up to go to the bathroom take a minute to stretch and loosen up for back a bit. After getting off the plane its would be a great idea to go see a massage therapist to help reduce the chance of developing chronic pain. One of the products we recommend for people that travel or have to sit for long periods of time is the Tush Cush, and it really helps alleviate stress on the back. We always keep it in stock at our chiropractic, physical therapy and pain management center. Its a bit surprising but a lot of people hurt themselves at the baggage claim. After a long flight bending and reaching down to grab heavy luggage can end up hurting you. The overhead storage bins can also cause injury to the lower back or shoulders, especially for people with a weak rotator cuff or other joint issues. Let a flight attendant help you with your bag when getting them down form the overhead bin if you know you might hurt yourself, and at the baggage claim tip one of the attendants to pick up and carry your luggage out to a cab for you. Unfortunately all of this holiday activity can quickly lead to some major issue like, chronic back or leg pain due to a herniated disc, or neck and arm pain. A herniated disc can cause Sciatica, a condition which can be painful enough to immobilize some people. Pain and tingling and numbness shooting down the leg can be a sign of a herniated or bulging disc impinging a nerve in the lumbar spine. If you feel that your back is just sore or "tight" the aforementioned tip about seeing a massage therapist would be a great decision. 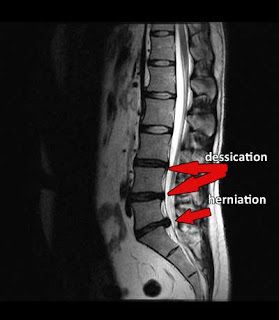 A bulging or herniated disc can be successfully treated without surgery using spinal decompression. Spinal decompression allows the intervertebral disc to heal itself naturally by alleviating pressure and letting the body's healing process take over to quickly help the patient recover. As always pay attention to your posture, take time to rest, relax and recover. Strengthen weak muscles and stretch tight one, a good Physical Therapist will show you how. If you have back pain see a chiropractor or look in to spinal decompression if you have a herniated disc and are in severe pain. I'm also a traveler and sometimes experiencing back pain. This post would really help a lot. Thanks for sharing this post!